Of course I work with Western music theory and I'm borrowing these scale-names with apologies from Carnatic music. What I have to say here is about generating ideas from the usual Western spellings of these scales and has nothing to do with the South Indian tradition. I want to start something more familiar that might not seem to be related to my main topic, but stay with me for a sec. Consider Neapolitan (1 b2 b3 4 5 6 7). This scale can be thought of as adding one extra note to the Whole-Tone scale, a symmetrical hexatonic scale. Since Whole-Tone is completely symmetrical (i.e. nothing is a mode of it) there is only one unique way to add a note to it. If you try to do it a different way, you just get a mode of what you started with. Put another way, the modes of the Neapolitan scale are the only heptatonic scales that contain a complete copy of the Whole-Tone scale. There are four more symmetrical hexatonic scales that we can try this trick with. Two are very obscure and not very symmetrical: 1 2 4 b5 b6 7 and 1 2 b3 #4 #5 6. Another is slightly less obscure because it's on Messiaen's list of modes of limited transposition, but again it's not very symmetrical: 1 b2 4 #4 5 7. The last one on the list is the so-called Augmented Hexatonic, which consists of a pair of augmented triads separated by a semitone: 1 b2 3 4 #5 6. It's been made slightly notorious by Jason Lyons's observation that it contains all the key centres of "Giant Steps". Indeed you can play the notes of the Augmented Hexatonic by playing any three major 7 arpeggios that are all separated from each other by major thirds -- for example, CΔ EΔ G#Δ. These are precisely the key centres used in the famous Coltrane tune. Together, Augmented Hexatonic and Whole Tone demonstrate the only two ways to make a six-note scale out of a pair of augmented triads. And we already know there's only one way (up to modality) to make a heptatonic from Whole Tone. So the question arises: What heptatonics can we make from the Augmented Hexatonic? 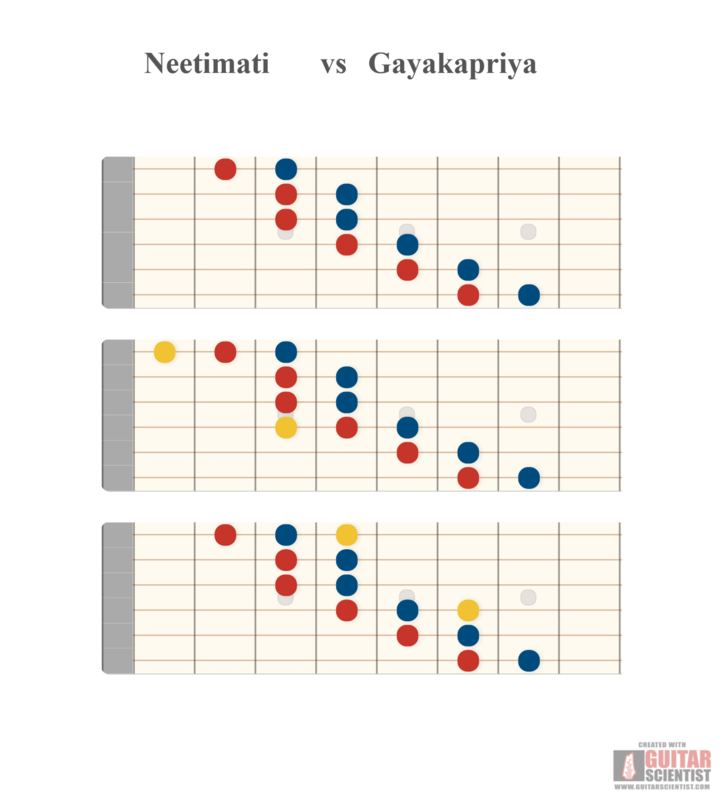 The attentive reader will already have the answer: the modes of Neetimati and Gayakapriya. This is their "secret connection". We get two scale groups rather than one because Augmented Hexatonic is less symmetrical than Whole Tone: it has two scales in its group rather than just one. Another way to say this is that Gayakapriya and Neetimati arise from the two hypermodes of Augmented Hexatonic. And this is in fact how I've been playing them for years without realising it: by playing those three Δ7 arpeggios displaced away from the root to get different effects. Although it sounds like a fancy way to describe it, for me at least the hypermodal approach is exactly what I do instinctively anyway.